Well, for starters, when it's "worth it" is totally subjective. It has everything to do with style. Some folks like a simple edge to edge pattern on anything, the subtler the better. Others like to use quilting as another layer of design, so they prefer to custom quilt everything! For myself, I look to custom quilting when I feel the quilt will benefit from an extra layer of interest. For example, my Love in Postage Stamps quilt felt a bit obvious. I custom quilted it to enliven the design, making it more unique. I also consider custom quilting for a time-consuming or extra special project. Not every special project benefits from intricate quilting, in my opinion. However, others really shine when given the deluxe treatment! Let's start with the basics. There are two main kinds of longarm quilters: hand guided and computer guided. If you prefer intricate quilting with a hand-drawn feel, consider a hand guided quilter. Be prepared for longer wait times and higher prices, as the work obviously requires more skill. If price and speed are more to the point, consider a computer guided quilter. Computer-guided designs are generally more even and precise. However, this may also mean that they are not perfectly scaled to every aspect of your patchwork. Keeping the above in mind, reputation and style are probably the most important factors when choosing your longarm quilter. Ideally have the quilter do a small, edge-to-edge project for you first, for an affordable preview of his or her work. Is the project completed on time, as expected and with no surprise fees? Does the style fit yours? 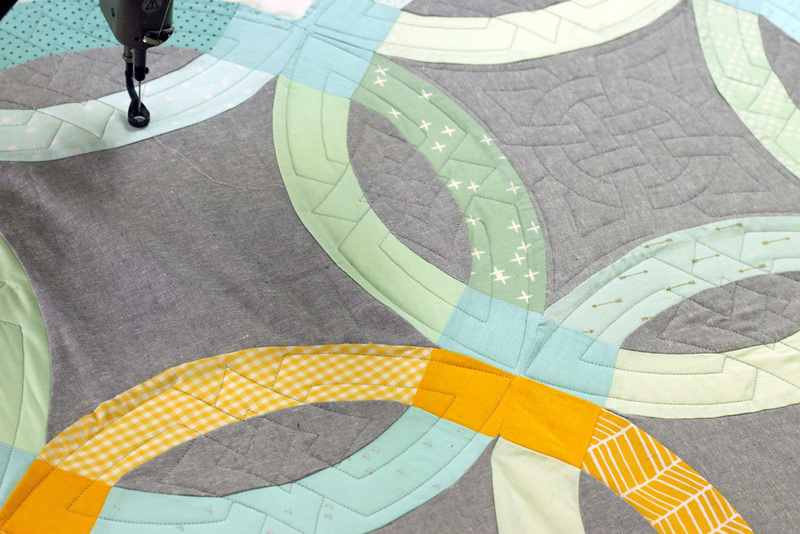 After a test run, you'll feel more comfortable investing in custom quilting. If you live near your quilter, arrange a visit to bring in your quilt, discuss quilting design and receive a quote. Some quilters will not set a final price until they've finished quilting, because they base their price on actual time required. Don't forget to ask when your quilt will be ready! Visit Order Custom Quilting to place your order. Pricing is based on quilt size in square inches. This pricing reflects a base rate for the simplest style of custom quilting: placing one pattern on each 10-12" block. With more complex custom quilting, additional fees will apply. But you'll always be aware of these fees before I start my work. Last night I finished custom quilting this stunning quilt by Michelle at City House Studio. It didn't require any additional custom quilting fees, so don't assume that everything fancy will be extra expensive. it entirely depends upon the time required, which I estimate in advance. 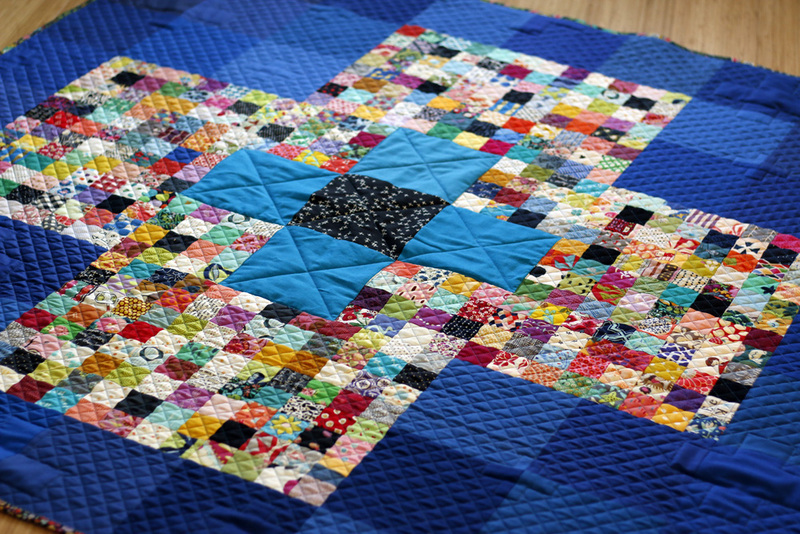 About half of custom quilts require extra quilting fees. So, why do I have this base pricing? As a customer I know how frustrating it is to have no idea how much custom quilting might cost. This pricing system gives you a frame of reference, helping you decide if custom quilting is right for your quilt. When placing your order, you will be invited to add your thoughts on quilting design. I always welcome your input! You can even send a drawing or link me to another quilt you like. However, most customers don't know what they'd like. That's fine! When your quilt arrives, I will take in the style of the patchwork and fabrics, as well as any comments you've made on your order form. Then I contact you via email with a design suggestion or two. With your feedback, I create a detailed quilting plan, including specific patterns which you can preview digitally. Agnes sent this lovely double wedding ring quilt, made as a wedding gift. Based on her comments, I selected a Celtic quilting pattern. The quilting has a clean, modern style while emphasizing the unique construction of the patchwork. Once your ideal quilting design is chosen, I will calculate any extra custom quilting fees. Fees are calculated in proportion to the time it takes to implement the quilting. Each block adds more time, since each one must be mapped, the pattern centered/scaled and then quilted with its own stop/start. If your quilt requires additional fees, I'll discuss via email and then, with your approval, send a Paypal bill. If you don't agree to the fees, we will work together to find a simpler, more affordable quilting plan. Or, you could even cancel your order for a complete refund, minus return shipping. Agnes' quilt is a good example of one that required extra fees. The double wedding ring has more "blocks" than normal square-blocked quilts, on which our custom pricing is based. A quilt of the same size with 10" square blocks would only have 49 blocks. Agnes' double wedding ring had 85 "blocks" in irregular shapes. Accordingly, I charged her an additional $180 to cover the time involved in mapping, placing and quilting the additional blocks. At Stitched in Color, I have one quilting schedule for all orders. Quilts are quilted in the order received, regardless of custom vs. edge-to-edge status. As a result, custom quilting doesn't have a longer wait! Custom Quilting is pricey, but the results can be incredible and sometimes transformative. It's hard to see these quilts go, but I love hearing from customers like Agnes and Michelle when they receive their quilts back! Their delight is contagious. I consider it an honor to be involved in the making of any quilt, be it via edge to edge quilting or custom quilting. I think I can say on behalf of all longarm quilters, "Thank you" for entrusting us with your precious handmades!